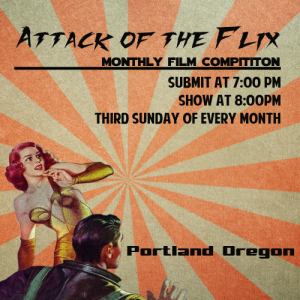 Attack of the Flix, presented by Microflix, is a monthly competition for Portland filmmakers held at the Curious Comedy Theatre (5225 NE MLK). This month’s show takes place Sunday, February 19, 2012. Submit your film if you are an Oregon or Washington filmmaker! Entries must be 10 minutes or less, and submitted on USB thumb drives encoded as AppleTV (see the FAQ for full details). Films are shown in the order they are submitted, and screened live on the interwebz! Vote for your favorite flicks – the first place winner receives a golden trophy! Admission is free (a donation bucket will be at the door). Curious Comedy Theatre is an all ages venue, and has a full bar. This recurring show takes place every third Sunday. Visit the Microflix website and the Attack of the Flix Facebook page for more details.